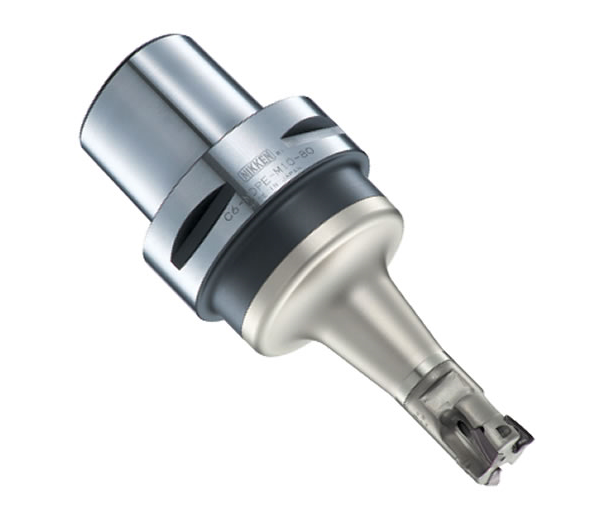 The new Nikken Pro-End Mill is a two piece milling solution designed to offer extreme performance on numerous applications including slotting, profiling, pocketing and ramping. The system is a two piece construction build around the Major Dream vibration dampening system. The base holder incorporates Major Dream which not only improves cutting performance but also considerably reduces costs by improving tool life and adding stability and accuracy to the cut. Our cutter is exclusive to Nikken and features high performance inserts which provide increased speed and feed rates and smooth shoulder blends. Interfacing both parts together is a screw and pilot system based on the popular Depo standard. This allows customer to, not only benefit from using Nikken's based holder and cutter together as a complete solution, but also utilise existing Depo style cutters and tools in conjunction with the Major Dream base holder. Nikken's Pro End-Mill SolutionNikken's Pro EndMill Solution profiling & slotting EN8 Steel on an NBT50 Spindle Machining Centre in our technical workshop at the Advanced Manufacturing Park. Available as standard on Nikken 2-Lock for both BT and DIN tapers the Major Dream Pro-End Mill also offers the benefits of dual contact for both flange and taper on suitable machine tools (2-Lock is also fully compatible with standard BT/DIN type spindles). 2-Lock increases the contact area considerably from around 44.4mm to 63mm (BT40) and also, as with all our NC tooling products, provides users with over 80% taper contact as standard. Additional standard options of course also include HSK and Nikken Polygon tapers.